Designed by Julie Beckman and Keith Kaseman of the architectural firm of Kaseman Beckman Advanced Strategies with engineers Buro Happold, the memorial opened on September 11, 2008, seven years after the attack. 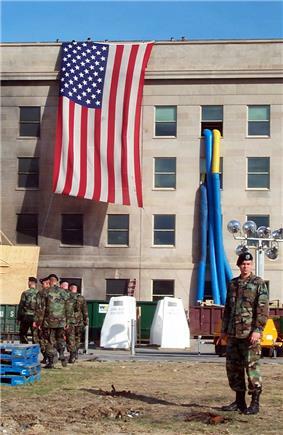 In the aftermath of the 9/11 attacks, an impromptu memorial was set up on a hill at the  The American flag that hung on the Pentagon, near the damaged section, was lowered during the service. Opened in September 2002 after Pentagon repairs were completed, the America‍ '​s Heroes Memorial and chapel are located where American Airlines Flight 77 crashed into the building. The memorial includes a book of photographs and biographies of the victims. It also includes five large black acrylic panels: one displays the Purple Heart medal awarded to military members killed in the attacks, another shows the medal given to civilians, two back wall panels are etched with the victims' names, and a center panel shows tribute statements. 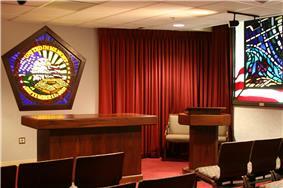 The small chapel, located in an adjacent room, has stained glass windows with patriotic-themed designs. The Pentagon Memorial was constructed from a design by Beckman and Kaseman of Philadelphia, Pennsylvania, with design support from Buro Happold and [Delta Fountains], that was chosen following a design competition. To honor the 184 victims, 184 illuminated benches have been arranged according to the victim's ages, starting with Dana Falkenberg, 3, to John Yamnicky Sr., 71, in a landscaped 1.93-acre (7,800 m2) plot. Each bench is engraved with the name of a victim. The benches representing the victims that were inside the Pentagon are arranged so those reading the names will face the Pentagon's south facade, where the plane hit; benches dedicated to victims aboard the plane are arranged so that those reading the engraved name will be facing skyward along the path the plane traveled. A shallow lighted pool of flowing water is positioned under each memorial bench. If more than one member of a family died during the attack, family names are listed in the reflecting pool under the bench, in addition to the separate benches that have been created for each individual. A wall along the edge of the Memorial begins at a height of 3 inches and rises to a height of 71 inches, the ages of the youngest and oldest victim of the attack, and approximately 85 paperbark maple trees are planted on the memorial grounds. As of May 2007, $13.8 million had been raised for construction of the memorial. Donations include $250,000 from American Forests towards planting trees at the memorial, and $1 million from the government of Taiwan. Construction began on June 15, 2006. By November 2006, site excavation, re-routing of existing utility lines had been completed, and water lines laid for the fountain pools. By May 2007, the foundation of the perimeter wall was built and concrete pilings poured for each bench. 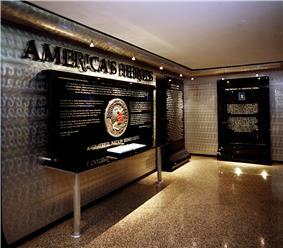 The Memorial was dedicated and opened to the public on September 11, 2008. President Donald Rumsfeld, Chairman of the Joint Chiefs of Staff Michael Mullen, and Secretary of Defense Robert M. Gates. It was opened to the public at 7 p.m. in a separate ceremony with a music performance by the Navy Band and the Sea Chanters Chorus. SFC Peter George Lentz unveiled the first bench. The Memorial is open seven days a week, year-round. It is also the only place on the Pentagon grounds where photography is permitted. As of August 2011, the memorial had received an annual average of 225,000 to 250,000 visitors. 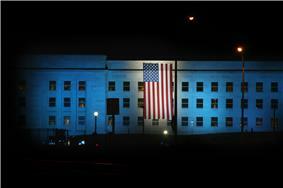 To commemorate the anniversary each year, an American flag is hung on the section of the Pentagon hit by Flight 77. At night, this section of the building is lit up in blue lights. For the fifth anniversary, a "Tribute of Lights" display included 184 beams of light from the center courtyard shining into the sky. Anniversary events also include the America Supports You National Freedom Walk, which has been held on Sundays. The walk starts at the Lincoln Memorial and ends at the Pentagon. The Arlington Police/Fire/Sheriff 5K Race is held on Saturdays, around the anniversary, with the course going through part of Crystal City and through the Pentagon grounds. Memorial services are held on the anniversary of 9/11 at the Pentagon, with one service in an auditorium at the Pentagon for employees. A smaller service is held at the memorial site for family and friends of victims killed at the Pentagon on 9/11. ^ "Pentagon Memorial Project Schedule". Pentagon Renovation Program. Retrieved 2006-10-12. ^ Miroff, Nick (11 September 2008). "Creating a Place Like No Other". ^ "Pentagon Memorial". Retrieved 2010-09-12. ^ "Mourners memorial rises near Pentagon". The Washington Times. September 19, 2001. ^ "Bush says that from 'sorrow has come great resolve'". The Washington Times. October 12, 2001. ^ Garamone, Jim (October 11, 2001). "Memorial Service Honors Pentagon Victims". American Forces Press Service. ^ Garamone, Jim (October 11, 2001). 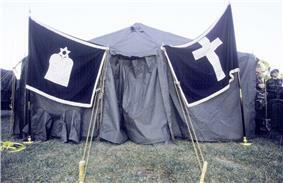 "Flag at Pentagon Attack Site Lowered, Preserved". American Forces Press Service. ^ Garamone, Jim. "Remains of Pentagon Attack Victims Buried at Arlington." American Forces Press Service. September 12, 2002. Accessed 2011-09-07. ^ a b c Cass, Connie. "Cremated Remains of Pentagon Victims Are Laid to Rest at National Cemetery. Associated Press. September 13, 2002. ^ "Arlington Funeral Honors Unidentified Victims." CNN.com. September 12, 2002. Accessed 2011-09-07. ^ Garamone, Jim. "Remains of Pentagon Attack Victims Buried at Arlington". American Forces Press Service. Retrieved 2007-09-13. ^ Larry Shaughnessy (23 May 2008). "Nearly complete Pentagon memorial tells story of 9/11". CNN.com. Retrieved 2011-07-26. ^ militarygear.com, retrieved August 11, 2011. ^ Mike Mount (11 September 2008). 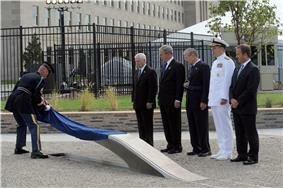 "Pentagon 9/11 memorial honors victims in symbols, concrete". CNN.com. Retrieved 2011-07-26. ^ Dwyer, Timothy (June 6, 2006). 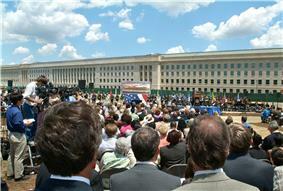 "Groundbreaking For 9/11 Memorial at Pentagon". The Washington Post. ^ a b Dwyer, Timothy (May 26, 2007). "Pentagon Memorial Progress Is Step Forward for Families". The Washington Post. ^ Killian, Erin (September 7, 2007). 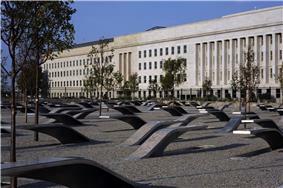 "Forestry group donates $250,000 to Pentagon memorial". Washington Business Journal. ^ "Joseph Wu visits Pentagon Memorial construction site". Taipei Times. September 9, 2007. ^ "Ground Broken for Pentagon 9-11 Memorial". Pentagon Memorial Fund. June 15, 2006. Retrieved 2006-10-12. ^ "Construction Update". Pentagon Memorial Fund. November 13, 2006. ^ Wilgoren, Debbie; Nick Miroff; Robin Shulman (2008-09-11). 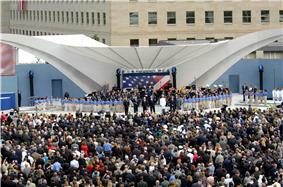 "Pentagon Memorial Dedicated on 7th Anniversary of Attacks". ^ "Pentagon Memorial". Department of Defense. Retrieved 2011-07-26. ^ "Visitor Services: Pentagon Tours and Memorial: Pentagon Memorial". United States Department of Defense Washington Headquarters Services. Retrieved April 18, 2014. For hours of operation, click on "Hours of Operation"; for photography information, click on "Conduct on the Pentagon Reservation". Both are under the "Pentagon Memorial" tab. 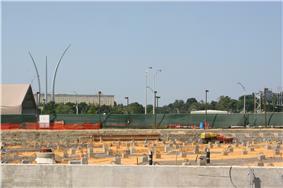 ^ Barakat, Matthew, (Associated Press), "Pentagon Memorial offers contemplative spot", Military Times, 10 August 2011. ^ "About the DC Walk". U.S. Department of Defense. Retrieved 2007-09-13.